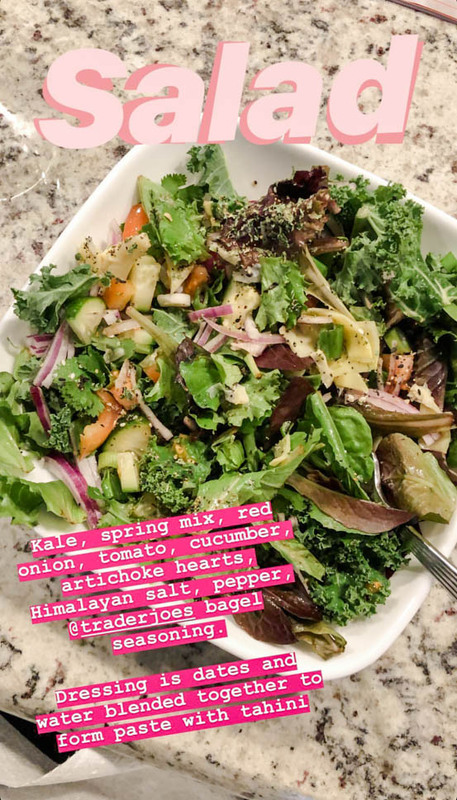 In case you all didn’t know, we share a ton of what we eat in our stories and story highlights on Instagram! Take our liquid B12, then we have our lemon water (HUGE mug) when we first wake up to rehydrate after sleeping. 20-30 minutes after that, we have our celery juice. We use this juicer and you can find all info about the celery juice here. 20 minutes after our celery juice, we will have breakfast. 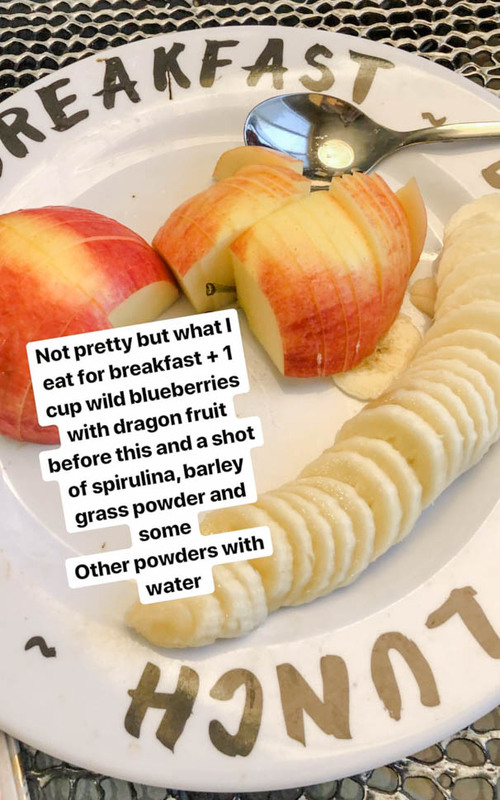 This will either be this smoothie OR we will make a shot glass of Spirulina and Barley Grass Powder and mix those powders with water before a big plate of fruit. Usually, we will have at least one banana, one big bowl of wild blueberries with unsweetened almond milk and cinnamon, and a big apple. Other times, we may have some strawberries, papaya, or any other fresh or frozen fruit we have around! 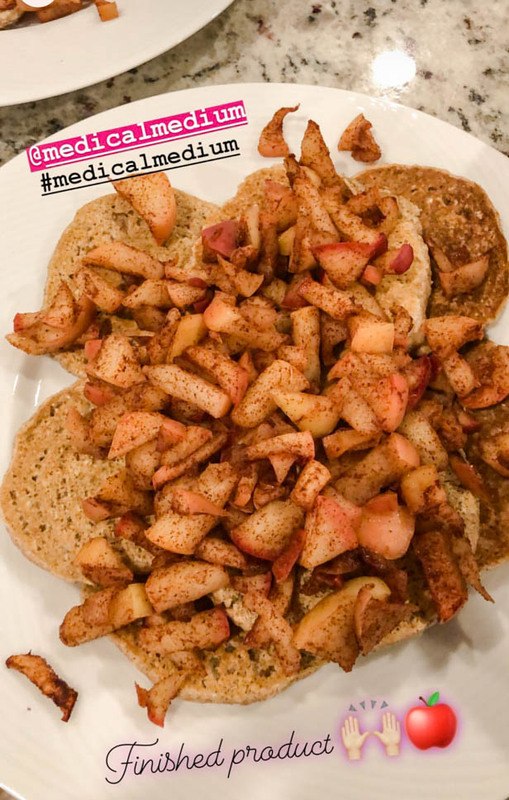 We also take a few supplements that we will cover in another blog post like Zinc, a liver supplement, a thyroid supplement, and Vitamin C.
We usually like to stick to fresh fruit or breakfast, but the other day, we made these Apple Pie pancakes that were AMAZING and so easy to make. 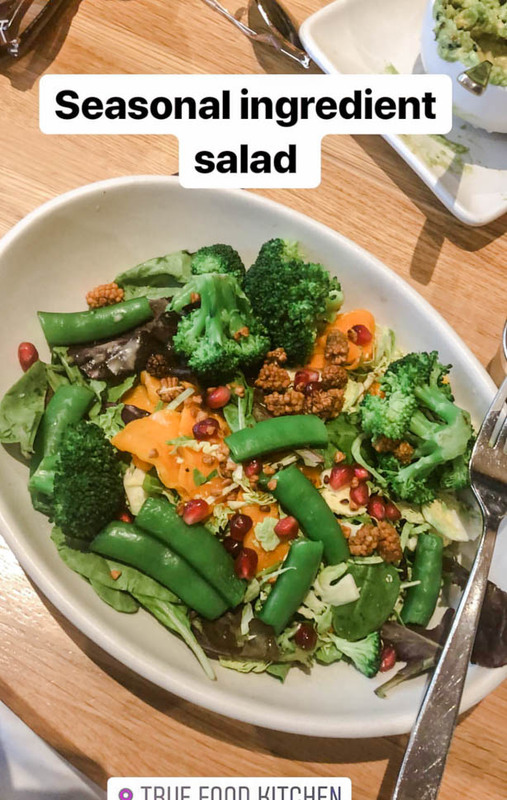 Honestly, we pretty much snack/graze all day, but for lunch, if we are at home, we almost always make some sort of salad, and we are not talking a little, baby salad. 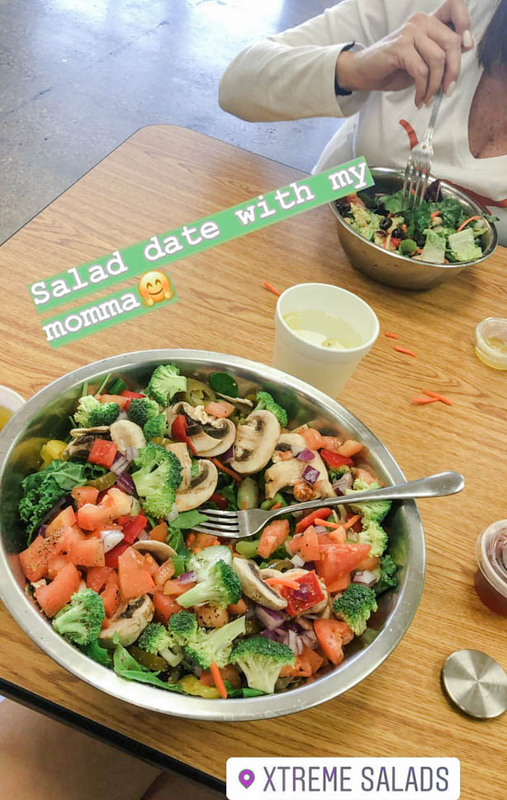 We eat out of big serving bowls, and usually fill those up once or twice with salad. We also will eat an apple or pear or some kind of carb like chickpeas or roasted potatoes if we are still really hungry! 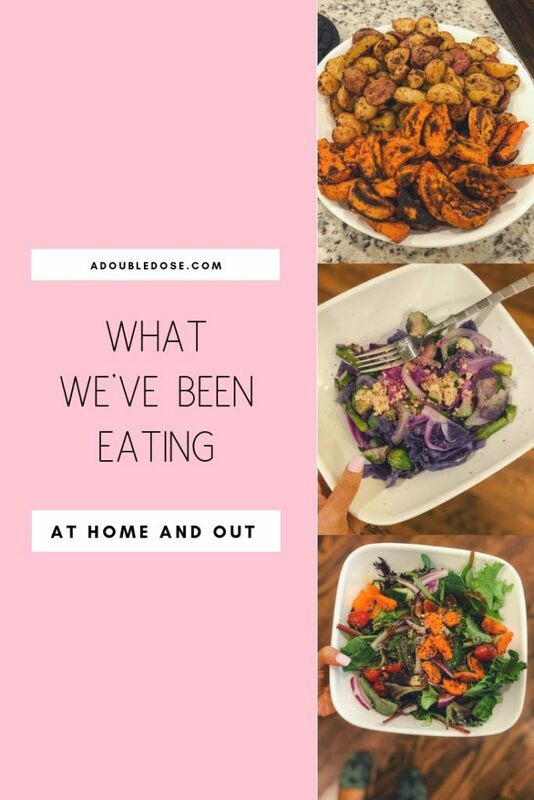 Some examples of what we eat at home are the salads below! 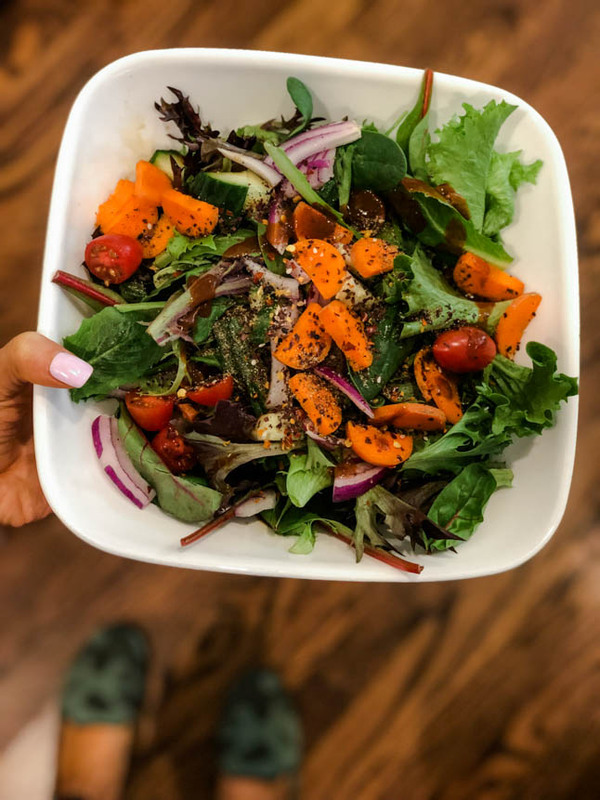 We stay pretty low fat, meaning we don’t use a TON of olive oil, but do use a little bit on our salads or in our dressings. 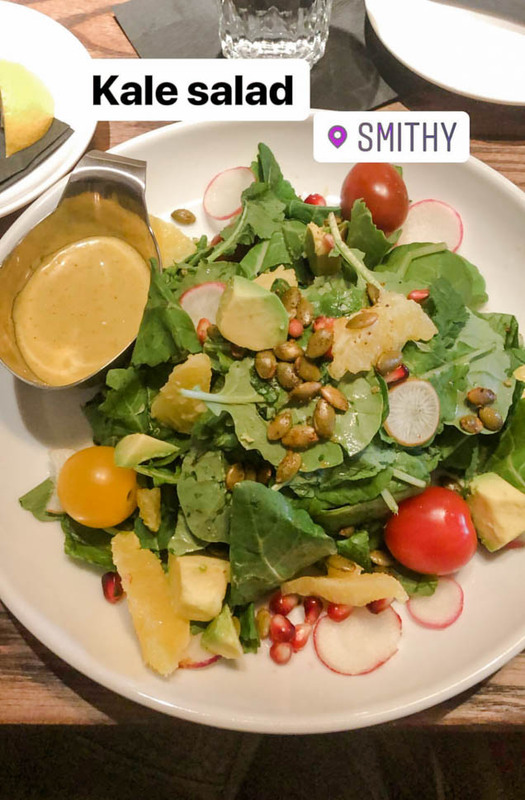 We love using Tahini as a dressing thinned out with some water and/or lemon juice, or using it in a dressing with other ingredients. 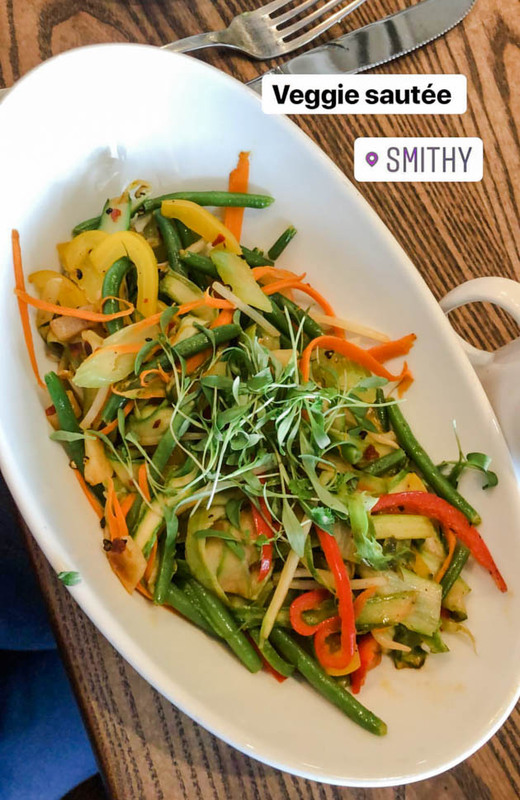 We don’t use a ton of vinegars right now, but will occasionally use red wine vinegar or balsamic vinegar on our salads. 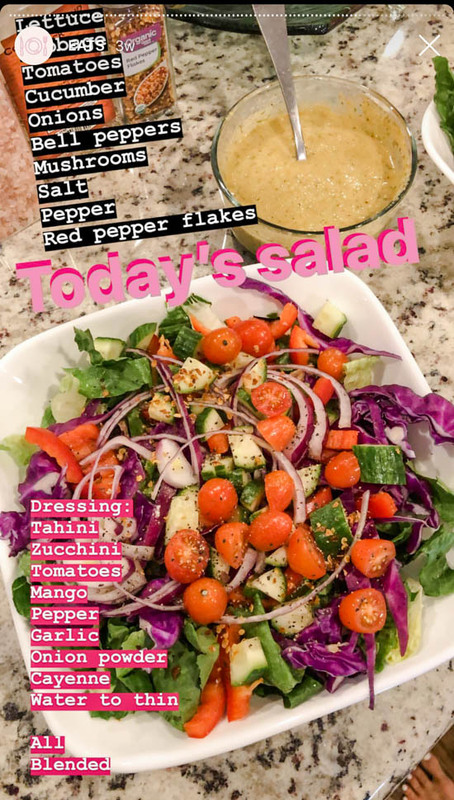 We also love using some salsa or coconut aminos as dressings– such good flavor! For seasonings on our salads or vegetables, we love black pepper, himalayan salt (has minerals in it! ), Trader Joe’s Everything But The Bagel Seasoning (so good on anything! 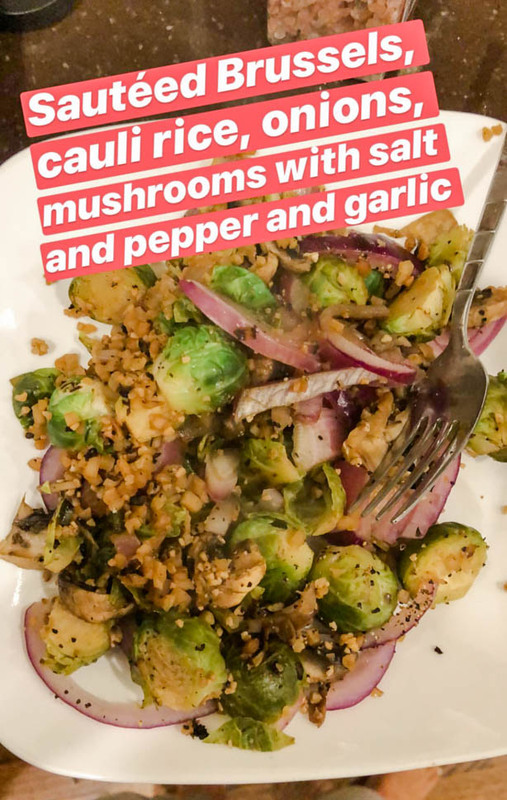 ), red pepper flakes, garlic powder, and so many more! 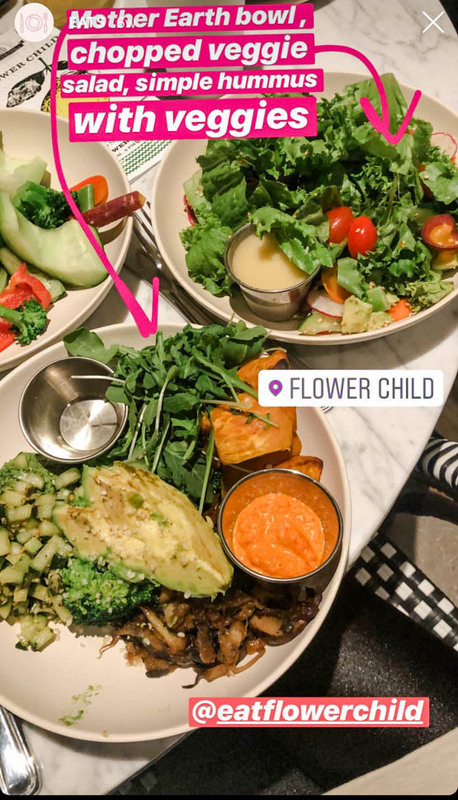 If we are eating out, we try to opt for a salad somewhere (more on our favorite spots in this post), or we will order some kind of vegetarian dish like steamed or sautéed vegetables, and a plain or sweet baked potato! 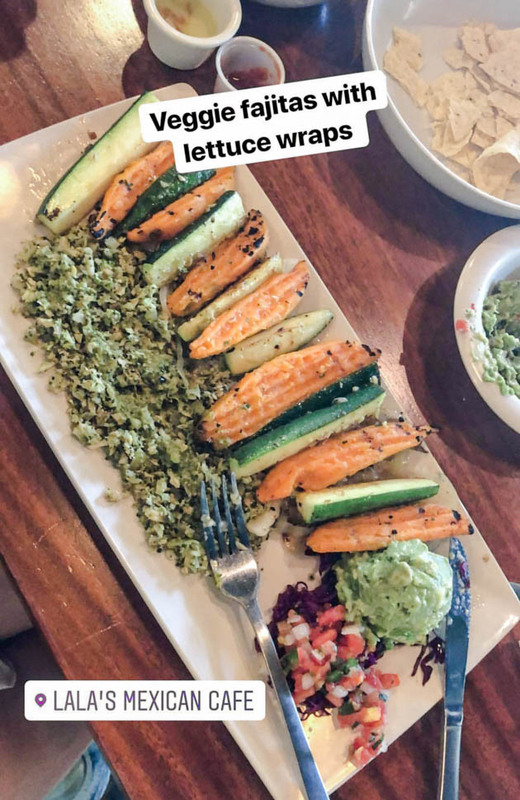 For dinner, we are usually over salad, but occasionally, we will opt for some salad with other things! Typically if we are eating at home, we will make sautéed vegetables of some sort with a carb of some sort whether it is this chickpea pasta, this red lentil pasta, or roasted potatoes. 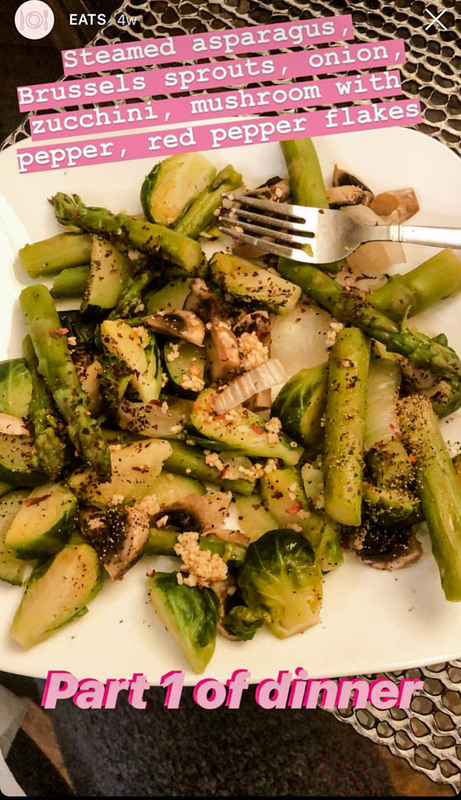 When we cook our vegetables, we don’t use a ton of oil, we just sauté in a pan with some water, and then put a lid on top to let the veggies cook. 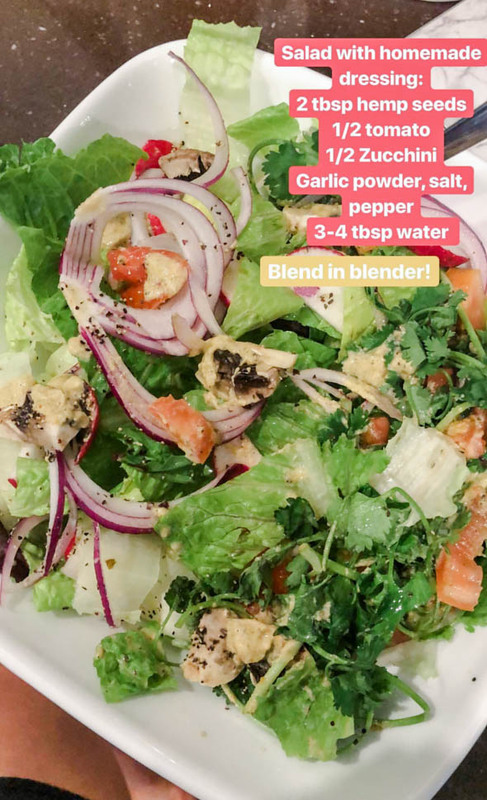 After that, we will add spices like garlic powder, black pepper, Himalayan salt, cayenne pepper, liquid aminos, and coconut aminos (so good on salads or in sauces!). 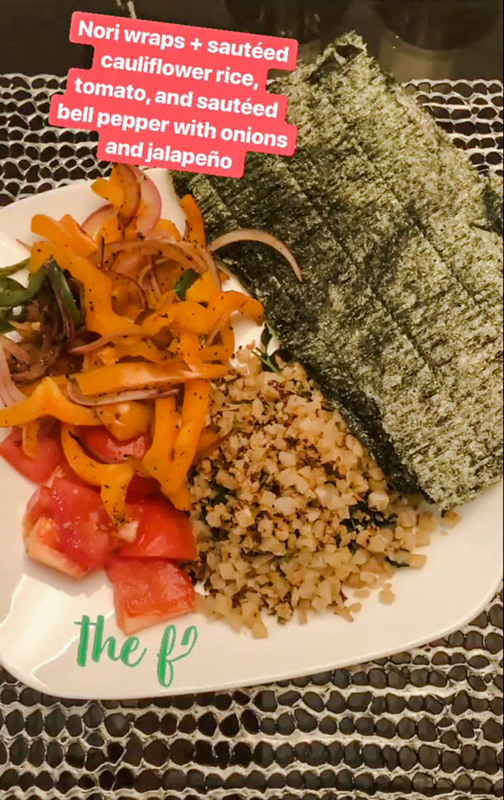 SO many of y’all were asking for this recipe, so here y’all go! Heat olive oil in large pot over moderate heat. Add garlic and chopped vegetables and half the parsley and sauté for 3 minutes. Add tomatoes, salt and pepper, bay leaf, broth, water. Bring to a boil, then reduce heat to medium-low. 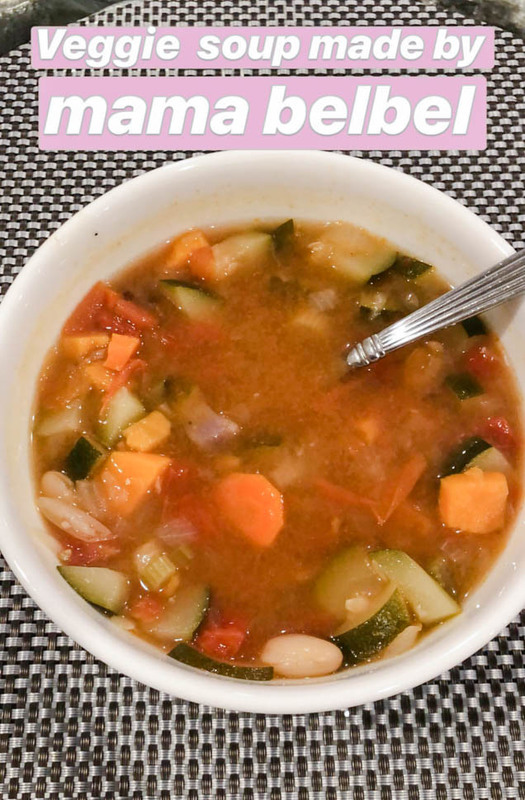 Cover partially and simmer 30-45 minutes, or until vegetables are tender. Remove bay leaf and serve! 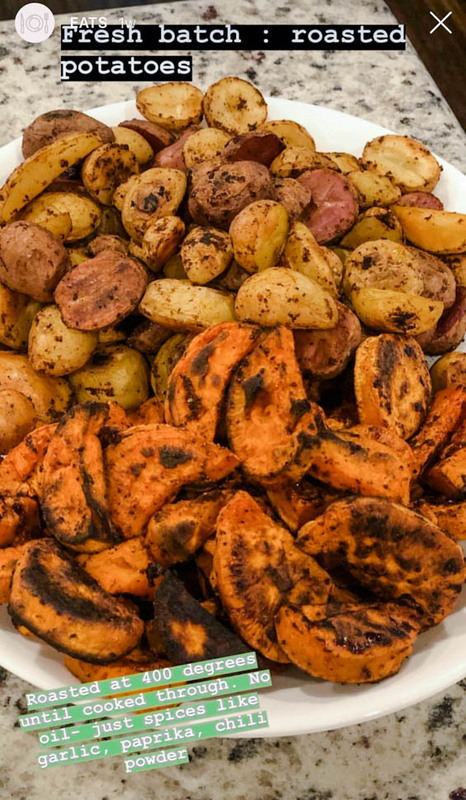 These potatoes are our FAVORITE! We use any kind of potato (sweet potato, golden potatoes, etc.). 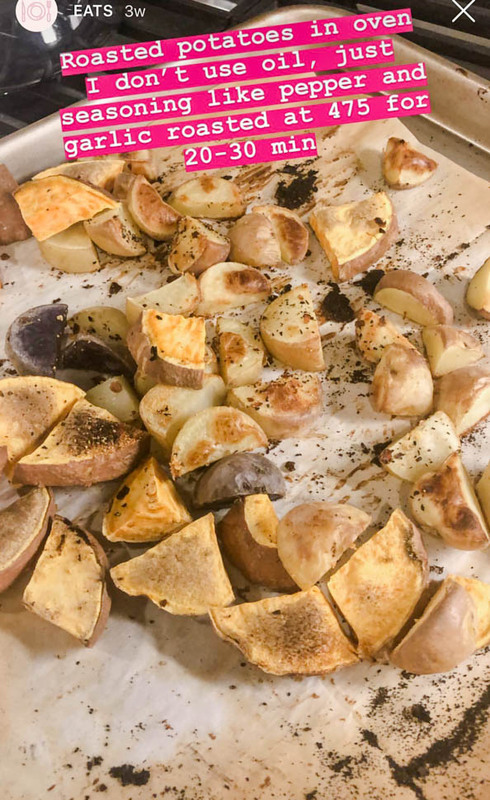 Simply slice potatoes and bake on parchment paper with spices like garlic powder, pepper, salt, and cayenne pepper. Bake at 400 until cooked through! 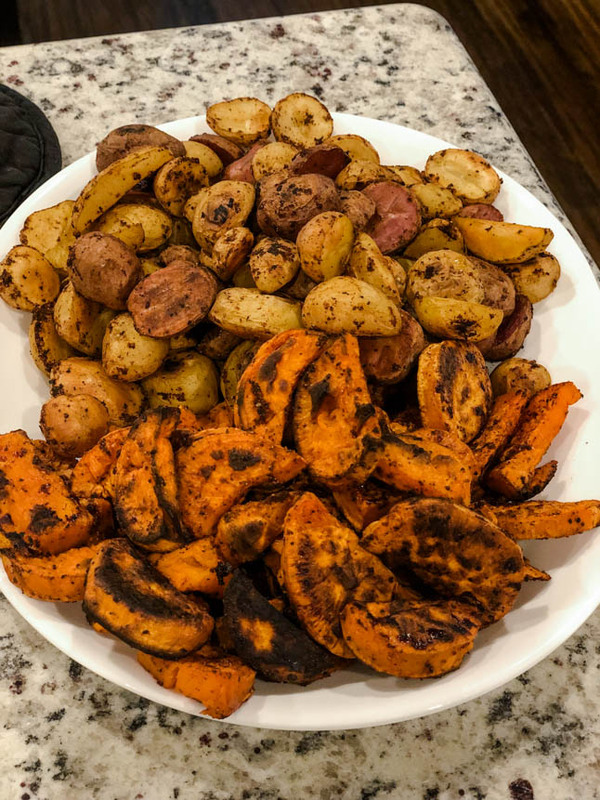 Also, we LOVE using our air fryer to roast potatoes. So easy and convenient! 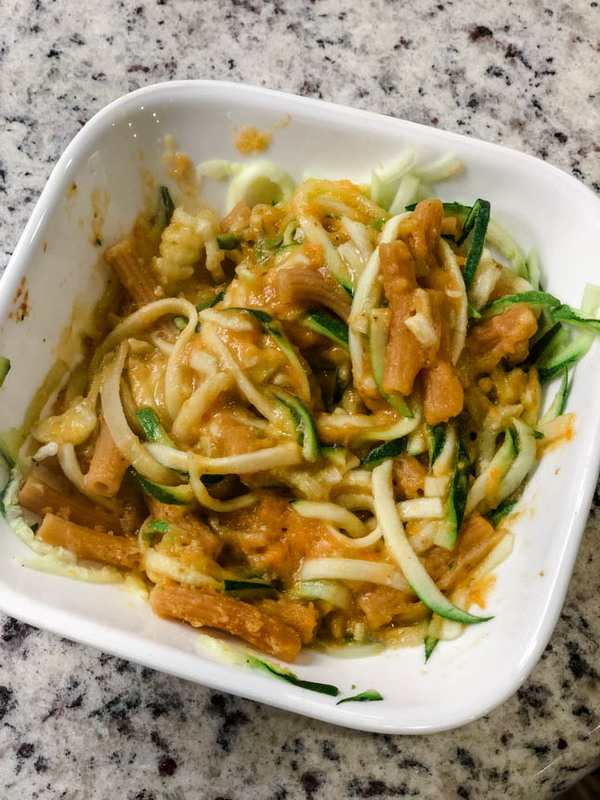 We love making zucchini noodles (we use this tool to make them)! 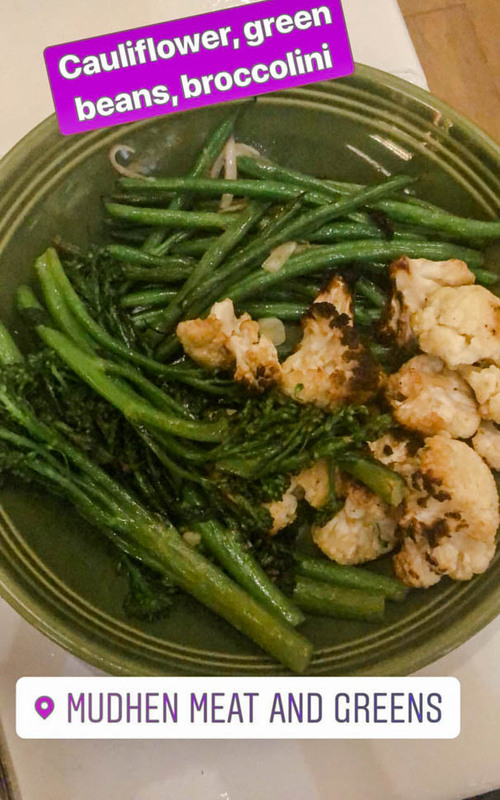 Either serve with plain tomato sauce (this Pomi brand is our favorite! 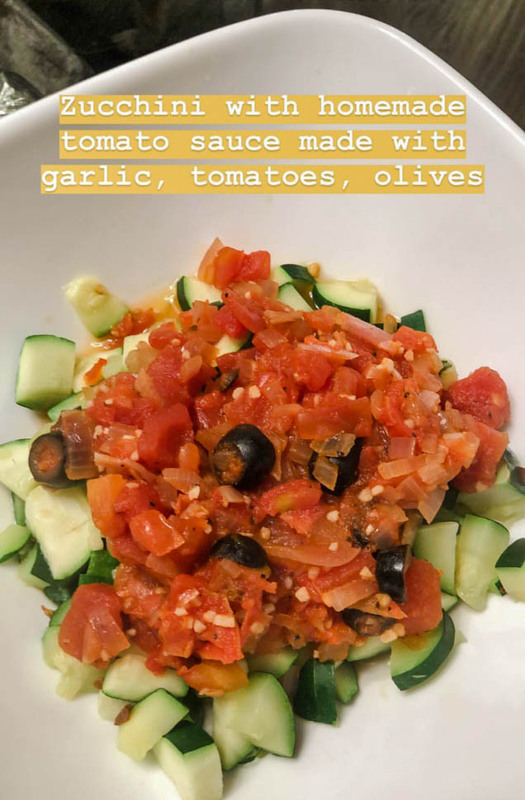 ), or make a sauce out of potatoes and carrots we found on Instagram! 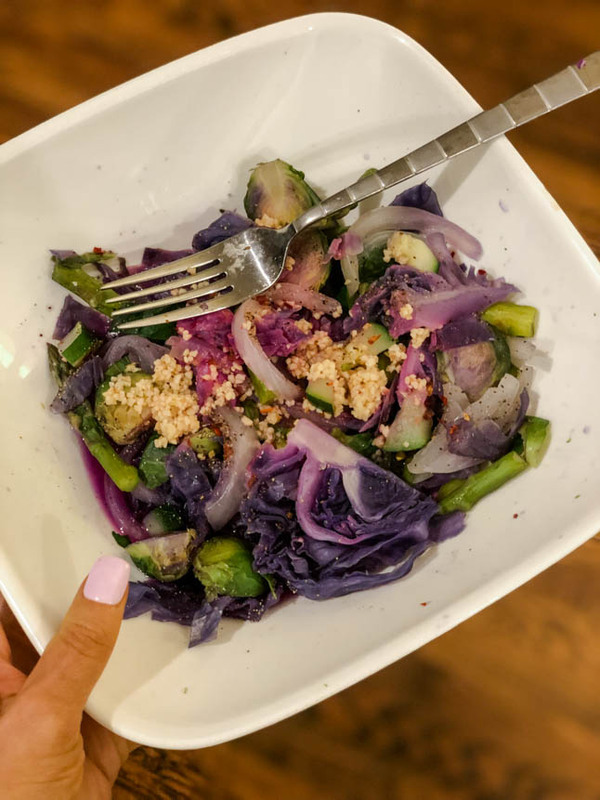 Another sautéed cabbage and veggie meal! 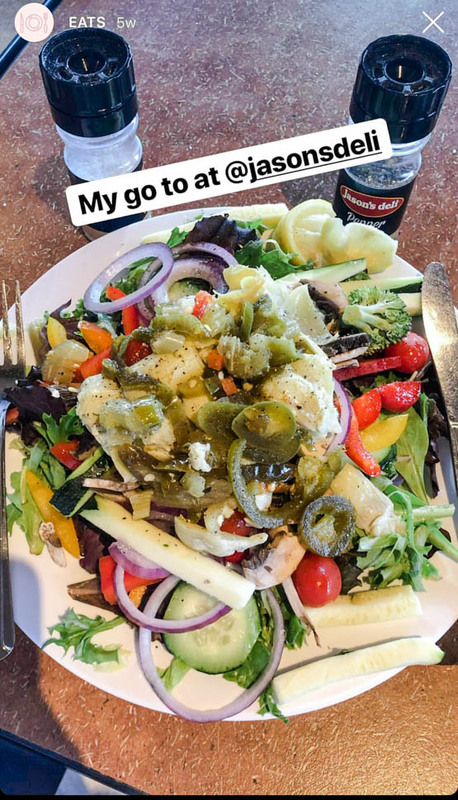 When eating out, similar to lunch, we will order some kind of salad (dressing on the side) or veggie plate! 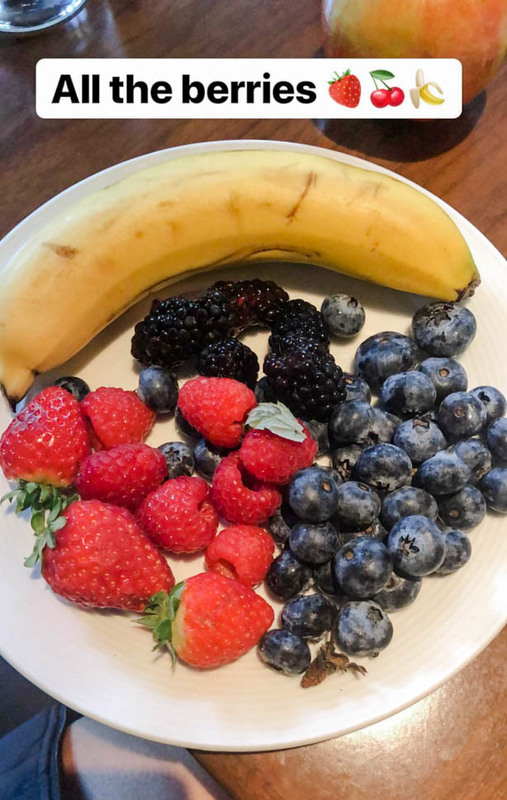 As far as snacks, we eat TONS of fruit. Literally, we probably eat at least 3-4 large apples a day, haha. 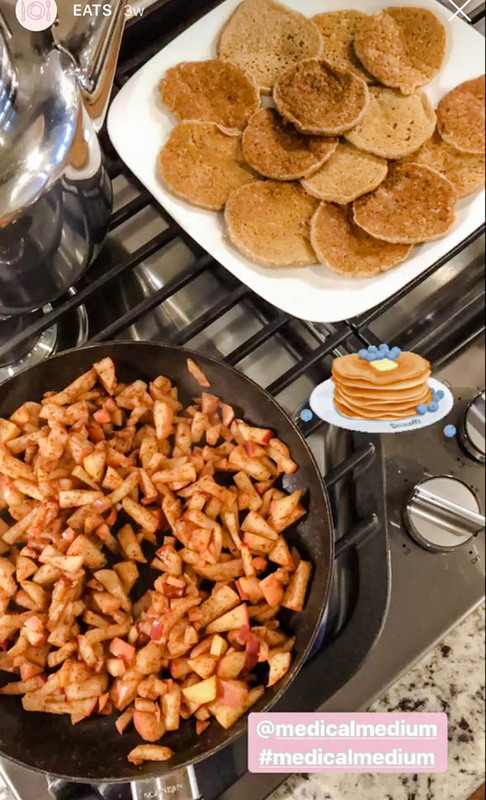 We always have to eat something before bed, so we will either bake something fun with almond flour or oat flour, or have some fresh fruit like apples, pears, mango, or berries. 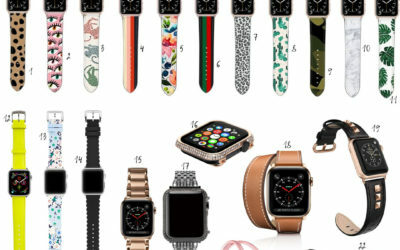 We hope this was helpful to you all! 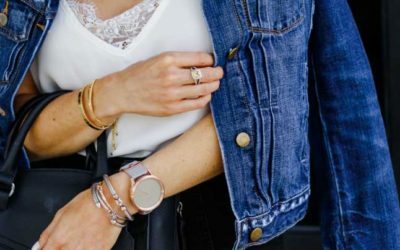 It is not exciting at all, but we feel a million times better and there are so many recipes and ideas on Pinterest and Instagram, if you’re looking for more! 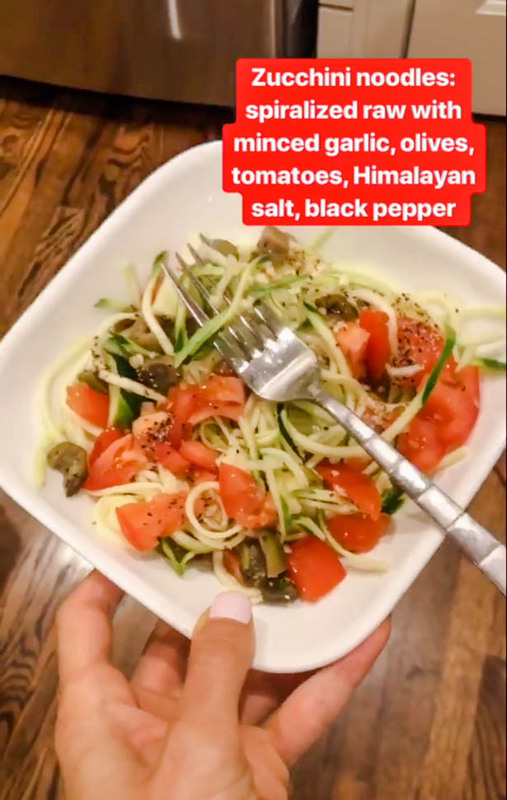 In case you all didn't know, we share a ton of what we eat in our stories and story highlights on Instagram!